4Asist. Dr., Necmettin Erbakan Üniversitesi Meram Tıp Fakültesi, Göz Hastalıkları Anabilim Dalı, Konya, Türkiye Purpose: To evaluate the effect of silicone oil (SiO) on retinal nerve fi ber layer thickness (RNFLT) by using optical coherence tomography in patients who underwent pars plana vitrectomy and SiO injection for retinal detachment. Material and Methods: A total of 50 eyes of 50 patients were retrospectively enrolled in this study. 34 patients (68%) were male,16 patients (32%) were female. SiO was injected in 50 eyes and the healty fellow eyes (50 eyes) were evaluated as controls. 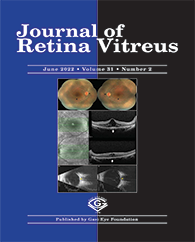 RNFLT measurements were compared with the control eyes,one and three months after PPV and one month after SiO removal. Results: In siliconized eyes the temporal, inferotemporal,nasal,inferonasal quadrants and global measurements were signifi cantly thicker at fi rst month after PPV compared to controls (p=<0.001,p=0.001,p=0.044,p=0.002,p=<0.001 respectively). Temporal quadrant and global measurements were signifi cantly thicker at third month after PPV (p=0.001,p=0.034). At fi rst month after SiO removal, the temporal, nasal quadrants, global measurements were signifi cantly thicker (p=0.004,p=0.01,p=0.018). Also siliconized eyes RNFLT measurements were evaluated between fi rst, second and third visit separately. Almost there was no signifi cant difference in quadrants for the measurements of the subsequent visits.